Preschool Goodbye Songs that Kids and Teachers Love! These preschool goodbye songs are a great way to bring the day to a close. Whether it’s the end of circle time, storytime, or the preschool day, a goodbye song or a closing song is a great transition to finish things up. It is never easy to say goodbye! Especially after having so much fun with all of our friends. At the conclusion of every program for 2-5-year-olds, I will ask for the children to clap for themselves (for great listening skills, and/or behavior) before asking them to join me in the well-loved Sharon Lois and Bram Skinnamarink song. When concluding a program or school day, the transition becomes much easier if there is there is an incorporation of a special closing song. This signature goodbye song can indicate this last sequence of the daily routine in a warm and fun way! My experience in library programming has shown the closing song routine regularly brings children feelings of not only being proud and excited about their library visit, but it gives them confidence having mastered the song with accompanying motions. Jbrary shares the wonderful and fun See You Later Alligator. Sing it to the tune of Clementine or Happy Birthday! This one is guaranteed to be a crowd pleaser. Give a hug ladybug. Give a kiss, jellyfish! You probably recognize this one! Sharon Lois and Bram’s Skinnamarink is a perfect goodbye song. It’s what we like to call an oldie, but a goodie! This is a sweet and simple goodbye song that kids will love and learn easily! Grab a favorite stuffie or loved stuffed animal and join the wiggles in this adorable goodbye song for kids. The Learning Station gives us a fun goodbye rhyming song that kids love to sing, and it’s a perfect way to end the day! You can find their CD on Amazon. 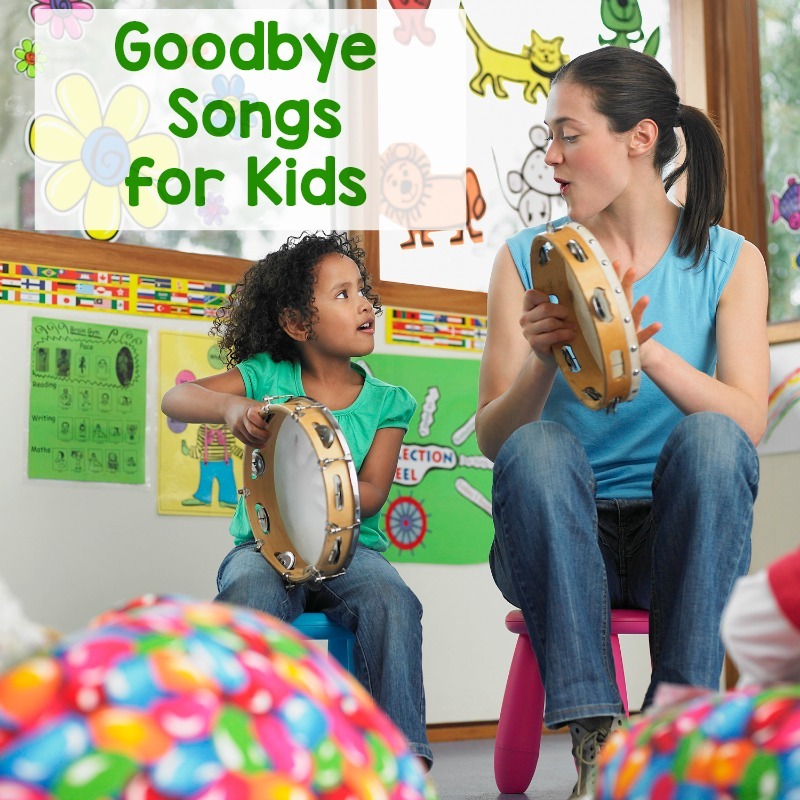 The Kiboomers have a special way of making goodbyes go smoother in this fun preschool goodbye song. Bev Bos, a pioneer in the child development field, sings this beautiful song to end a day with. Twinkle, Twinkle Little Star is a perfect closing song and a great way to end time with little ones. End the day on a positive note with these goodbye songs for kids by Super Simple Songs. 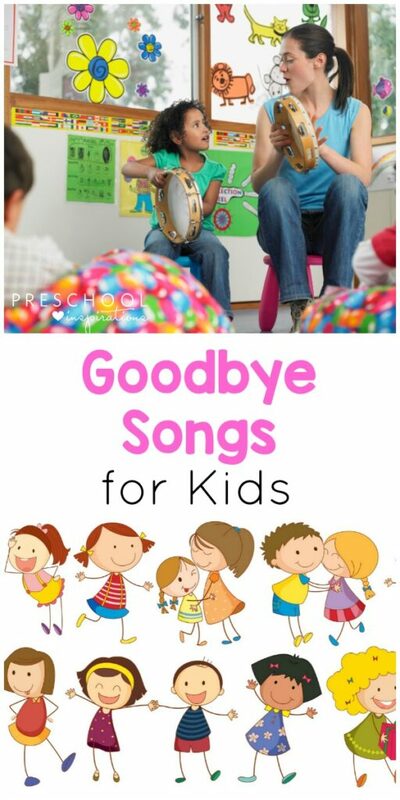 This preschool goodbye song is also an action song and is a great way to add some clapping and movement in too! This is an upbeat goodbye song for kids that has lots of repetition and cheer! Dr. Jean has a wonderful song for every ocassion, and this upbeat goodbye song for kids is an absolute favorite! If you love the original Day-O song, then this is going to be well-loved too from The Learning Station. You can grab their CD here. Want even more awesome children’s songs? Do you have a favorite goodbye song for kids that you use too?